Further Comments: The story of a ghostly spitfire appearing here was carried in the local press; it was actually Spitfire BM597, owned by the Historic Aircraft Collection, and was operating from Pent Farm Aerodrome on the day in question. Further Comments: Two Czech pilots died here on 22 October 1941, crashing in the field as they ran out of fuel. A local farmer rushed to the field in an attempt to save them, but was beaten back by the flames. He did, however, see a black cat emerge from the burning wreckage. The creature made its home with a local old woman, and when she died, the cat vanished, but appears once every ten years at the crash site. Further Comments: Seen by huts near the former Officer's Mess, a ghostly Military Policeman is said to walk around the area. There are also reports of phantom aircraft, including a P-47 and a B-17. Further Comments: Now little more than a collection of old huts, the area is haunted by the sounds of crashing WWII aeroplanes, shouting airmen, and other noises. Further Comments: A father and daughter driving eastbound spotted a Lancaster bomber flying nearby, smoke coming from a left right hand engine. They passed under Scammonden Bridge, and after coming out were no longer able to see the aircraft. Further Comments: Towards the end of World War 2, L'il Butch was shot down during a bombing run on Germany, but briefly reappeared at the air base a few months later, as if it had just landed. Little exists of the airfield now - an industrial site now stands on the area, and fields cut off access to the runways. Further Comments: Richard and Helen Jephson were reported in local news as having witnessed a Lancaster bomber which flew low and silent above them. They expected the aircraft to crash into a nearby wooded area, but it did not happen. Further Comments: A disastrous bomber landing resulted in almost a dozen deaths, a wrecked farmhouse, and three more bombers ruined as they sat on the ground - the crew of the aircraft responsible have been observed in a hanger on the site. Further Comments: This lonely airman sits by the side of the road, patiently waiting for a lift which has never yet arrived. Further Comments: This pilot, thought to date from the Second World War, has been seen in the control tower at the air force base. He may have been the source of the disembodied voice which said 'hello!' to a man walking through an empty hanger. Chatting has been heard in the crew room, though when investigated it has been found devoid of life. Guy Gibson's dog is also reported to haunt the base, killed on the road outside in 1943. Further Comments: During World War One a pilot reported greeting Lieutenant Salter as he walked into the officer's mess, and the Lieutenant responded in kind; unbeknown to the witness, Salter had just died in an air crash many miles away. Further Comments: Two men travelling back to Waddington spotted a figure wearing a long cloak or tail coat disappearing into a hedge row towards the airbase. One witness said the figure was transparent or shadowlike, and did not appear to have any legs. Further Comments: This pilot died when his spitfire crashed into the marshes during World War 2. This tall, dark uniformed man has been reported in several buildings along the road. Some also report that the sound of a German aircraft crashing into the marshes here can still be heard. Further Comments: In 1929 an old Vickers aircraft crashed in this field, killing its two crew members. The crash was heard several times over the next few years by locals, and was even reportedly seen; the plane glowing blue in the pale moonlight. Further Comments: Nicknamed 'Fred', this phantom resembles a young RAF pilot in overalls. Due to the proximity of the caf� to the former RAF base, it is speculated he was based there during World War Two. Further Comments: This phantom officer in RAF uniform is thought to return briefly around May time, in regret for sending dozens of young men off to their deaths, in particular a close friend of whom he was particularly fond. The remaining control tower is thought to be particularly haunted, with footsteps and crashes heard and a poltergeist like entity throwing stones and broken glass at people who venture too close. Further Comments: A female witness reported interaction with the ghost of a World War 2 RAF officer at this site. The figure in brown walked up to her, introduced himself as 'John' and, as he touched her hand, vanished. Further Comments: Several people driving together during World War Two witnessed a plane crash here - when they investigated, all they could find was the monument to the first two members of the Royal Flying Corps to die in a plane crash. Further Comments: This decapitated shade nicknamed 'Strubby' is the result of a Lancaster bomber crash near the hanger area during the Second World War. Further Comments: Several entities are reputed to haunt this museum. The bottom half of a man has been seen walking around the hangers, wearing black trousers but no shoes. A phantom hound reputedly remains here, and poltergeist activity has also been reported - one witness watched an old fashioned gramophone, part of a static display, start to play unaided. Further Comments: Mynarski died after trying to save a trapped pilot in a Lancaster bomber as it dived towards earth, and was awarded the VC for his efforts. His restless spirit currently walks the area he was stationed during the war, and was seen outside the control room and hangers in the 1950s. Another version of the story names the phantom as a Canadian pilot named Mullen. In 1982 a pilot reported feeling a weight on his bed which vanished when he told it to go away, and although this could be sleep paralysis, the pilot researched further and found 20 more people who had experienced the same event. Further Comments: One man reported smelling a full English breakfast being cooked, though he was in the middle of an empty car park. He was later told that the location where he stood was once the site of mess tents. Other places on the airfield have their own ghosts. 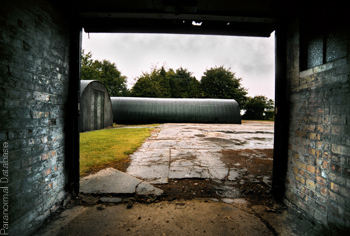 The Officer's Mess is home to ghostly footsteps, while policemen patrolling the airfield once peered into an empty hut, only to see a group of wartime airmen playing cards! Further Comments: This echoing voice has been heard on the ground here using a non-existent tannoy, barking orders at crews who died over fifty years ago. The sound is sometimes accompanied by the sound of a bomber warming up before take off.